The Beginner Guide to PPC Marketing // Sure Exposure, Inc. The Beginner Guide to PPC Marketing. At first glance pay-per-click (PPC) advertising can seem a bit bewildering. The unfamiliar terms and new ideas often intimidate people. 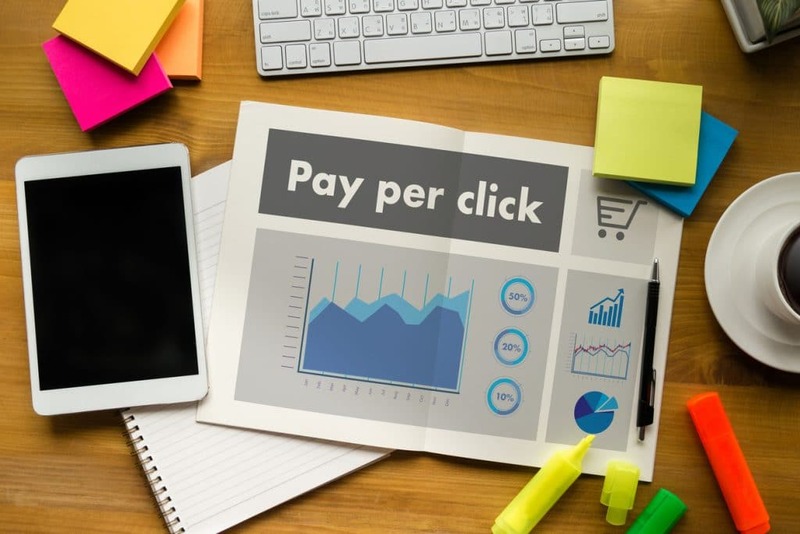 Fortunately, PPC is actually quite simple, and if you are new to the concept, this guide will give you all the basic information you need to understand it and approach it with confidence and knowledge. Pay-per-click or PPC advertising can refer to social media or search engine advertising with the most common form being Google AdWords, which accounts for more than 90% of search engine activity. Whether it is search engine or social media PPC, the principals remain the same. We will use PPC and Google AdWords interchangeably for the sake of this guide. The most important aspect of PPC is keywords, and everything else hinges on the keyword selection. By selecting relevant and appropriate keywords, you can get the attention of specific people based on their search criteria. This will get your message in front of relevant users who form part of your target market. As the name suggests, PPC means that you only pay if and when a user clicks on your link in your advert or message. This makes it extremely cost effective and highly targeted to people specifically interested in your product or service and will form a great source of qualified leads and a great conversion rate, relative to any other form of advertising. We will cover the numerous advantages of PPC later on; however, it forms a vital aspect of your overall marketing mix. The first step is to get your keyword selection correct. Spend a great deal of time and effort on this since it is not only important for PPC results but also for search engine optimization (SEO) of your website or blog. This will help your page achieve organic growth that will be further enhanced by other marketing, SEO and PPC efforts. Start with around 30 to 40 words that are specific and relevant to your target market. As with all marketing, you need to try to think like your customers. Ask yourself what words would they type into Google if they were looking for your product or service? After researching the potential keywords, narrow the options down to a maximum 4 to 6. Once you have determined your keywords, you need to set up your campaign on Google AdWords or whatever platform you wish to use for PPC advertising purposes. You will need to determine your budget and how to allocate it to different keywords in a process known as bidding. Before you can do that, you will need to rank your chosen keywords in order of priority. You will need to spread your budget out so that you allocate more to bid on the higher priority keywords. Next, you have to create ad groups of 2 to 4 adverts that appear when your keyword is used. Once the campaign is active, you to constantly measure the relevance and performance of the keywords and tweak or change them when necessary. This is an ongoing process but does not necessarily take much time. Highly cost effective. Because it is so specifically targeted, you only have to pay when a user takes action on the advert. There is very little waste. Provided you get the basics right, the ROI is excellent. There is no minimum amount, and you can adapt your budget as necessary. You can start a PPC campaign for a small amount of money. It is extremely measurable, unlike most marketing and advertising. You can determine your ROI with ease. PPC is flexible, and the adverts, budget, links, and all aspects of your campaign can be changed quickly and as frequently as you would like. It is essential to incorporate PPC into your marketing mix and SEO efforts. It has the potential to provide a great ROI and generate a great deal of new business if done correctly. Pay-per-click (PPC) advertising is a powerful and cost-effective way of promoting your business, generating leads, and making more sales. It has great potential and is not very difficult to manage, yet it very often goes wrong. There are numerous reasons PPC advertising can fail, and most of them are very basic mistakes that are easily fixed. You first need to establish exactly what your goals are, what you expect the PPC to achieve. Do you want to increase your page ranking, make your pages more visible to your target market, create brand awareness, generate leads, or generate sales? Once you are clear on your objectives, it will be easier to measure your returns. You also need to ensure your landing pages and copy are up to scratch. There is no point in paying for traffic to an ineffective page. Let’s look at a few of the common reasons PPC fails and what you can do to avoid or correct those mistakes. Keywords form the foundation and basis for your entire PPC campaign, so naturally, if you get that wrong, everything else will fail. It is essential that you measure keyword effectiveness and profitability regularly and make changes where necessary. People often cling onto keywords they know are not performing well in the hopes that they will pick up extra business. Instead, focus your spend on those keywords that translate into profitable business and cull the ones that don’t. To continue, it is important to measure the bottom line with each keyword. Do not focus on the cost per lead (CPL) as if the lead is of poor quality, and if the conversion rate is poor, the additional traffic and activity is worthless and can waste your time and energy as well as your money. Rather, increase the bidding on keywords that generate a profit after expenses. It takes time and money to get data on keyword effectiveness and conversion rates. While it might seem like a good idea to start low and build your bidding and spend up, this will mean a lot of wasted money before you fine-tune and target your keyword selection, budget and spend. It is more cost effective to start your bidding higher so you can quickly determine which keywords are profitable. This allows you to quickly adjust your bidding accordingly which will lead to a faster and higher return on investment. If you are going through the time, effort, and expense of driving people to your page, you’d better ensure that your copy is relevant to the link, stands out from the competitors, and captures the user’s attention. If your goal is sales, your copy also has to convince the user to take action. You have a few seconds to grab and retain attention, so the copy has to be compelling. Paying good money to get people to view poor copy is throwing money down the drain and achieves very little. This is a surprisingly common problem. Despite the number of cost-effective call management solutions, many companies still fail to monitor incoming calls effectively. You cannot manage what you cannot measure, so if you do not know what calls are coming in as a result of your PPC advertising, you will not be able to effectively manage the campaign and determine your ROI. As you can see, all of these issues have fairly simple solutions. Spend a bit of time and energy managing your PPC and you will ensure it is successful and provides a good return on investment. Neglect these factors, and your ad spend will be largely wasted and ineffective. Google’s local search results is critical to maximizing your visibility and converting traffic to sales. We will help you leverage and vastly improve your local and national search engine visibility. Click here and improve your SEO.